The DAF Scholarships are aimed at women and girls living in extreme poverty, with a good academic performance and a desire to help others once they have obtained their academic degree or professional training certificate, integrating themselves in our mutual aid network (Right Intention Network). The Foundation DAF, shall fully pay for all study costs or only a part, if some costs are considered non-assumable or unjustifiable. In principle, the scholarship covers exclusively the academic costs. Other supplementary aid (books, transport, subsistence allowance…) will be dealt with separately. In the event of being selected for the scholarship, tuition payments will be made directly to the educational institution or, preferably, to the delegate or guarantor of the foundation DAF of the area. The scholarships are granted exclusively to young women and girls who live in extreme poverty and with proven responsibility and excellent academic performance. Scholarships will be granted for one academic year and shall be renewed annually if the student does not violate any of the terms and conditions stipulated in the contract and accepted by the applicant. For poor school performance or abandonment of studies. Breach of any of the conditions set forth in the contract. Recommendation of the guarantor for reasons he/she must justify. For forged documents, provided by the applicant, the guarantor or both. Because the foundation cannot meet all the demands or commitments acquired for lack of donations and subsidies due to the international crises. Help others to the extent of your possibilities, following the philosophy of our foundation, which aims to create a network of people who help each other. Share your happiness with us after completing your studies and to allow us to share with all those who visit our web site that there is a new graduate thanks to the efforts of all the collaborators of the Foundation DAF, all over the world. Hence, you will be entitled to present your resume to all the companies that are financing us with their donations and to upload your resume on our web site in the Carriers section. 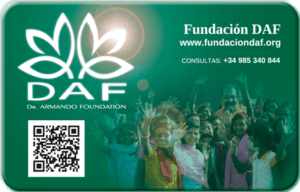 To be a “guarantor” of Dr. Armando Foundation means that, that person represents our foundation in a region or community to propose concrete actions to help individuals or groups in the specific fields where DAF collaborates: Health, Education and Assistance to Local Development and Vocational Training. DAF proposes as “guarantor” to those people or institutions that have all our confidence for their ethical background and selfless work in the community where they serve. Therefore, the “guarantor” of Dr. Armando Foundation must have a recognized moral status before his people. To apply for a DAF Scholarship, it is an essential condition, that it is processed by an “approved guarantor” of the FOUNDATION DAF. The Foundation DAF will check if the guarantor belongs to its organisation. To formalise the application please fill out the “Form (online)” or “Form (doc)”, accessing them through the links below. If the application is considered acceptable, the candidate must send the documentation requested by the Foundation DAF and always via the guarantor. The application must be duly completed with total honesty and in full detail. Incomplete applications will not be considered. In regions where the foundation does not have a representative, the candidate must get in touch with us by sending an email to, becas@fundaciondaf.org, attaching a letter of recommendation from an official education agency in your area. You can access this form here and fill out the data requested. If any question has not been answered, the form itself will remind you to complete it. Upon completion of the form a copy will be sent automatically to the guarantor’s who requested the scholarship and another copy will be sent to the foundation DAF. Upon receipt, DAF and its representatives, will examine the application and notify their decision, as well as the next steps in the process to your guarantor. As in the online option, upon reception of the form, the foundation DAF and its advisors will examine the application, and notify their decision, as well as the next steps in the process.